The Chesapeake Bay Bridge-Tunnel connects Virginia's Eastern Shore with the Virginia mainland at Virginia Beach near Norfolk. It is a modern engineering wonder, a tourist attraction and a travel convenience. 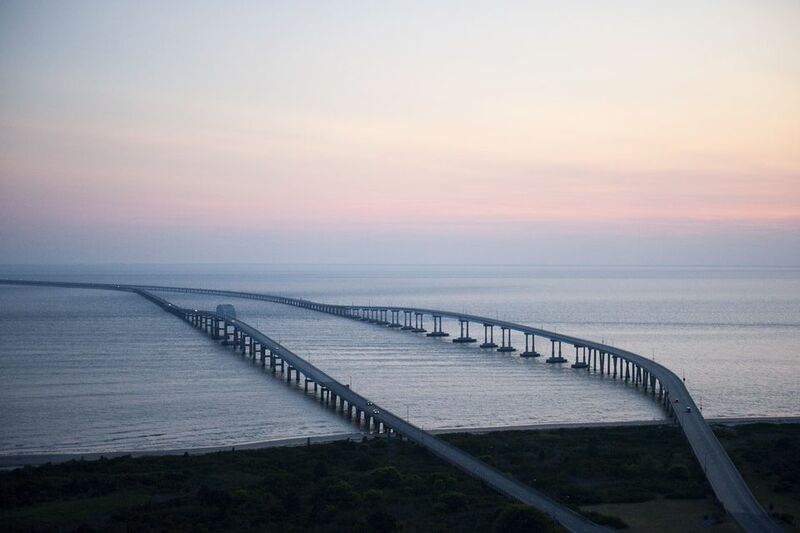 The Chesapeake Bay Bridge-Tunnel is a four-lane 20-mile-long vehicular toll crossing that provides direct access from Southeastern Virginia to the Delmarva Peninsula (Delaware plus the Maryland and Virginia Eastern Shore). It is really a unique experience to travel across the Bridge-Tunnel. There is a full-service restaurant, the Chesapeake Grill, with restrooms and a gift shop on the bridge. You can purchase a variety of items that are produced in Virginia including food, wine, clothing and more. There is also a scenic overlook and fishing pier which are great places to stop and take in the magnificent views of the Chesapeake Bay. Please note that The Chesapeake Bay Bridge is a separate entity that crosses the bay in Maryland from Sandy Point (near Annapolis) to Kent Island. Toll rates are highest during the peak season, Fridays through Sundays, from May through September. The current rate (effective January 1, 2014) for a two-axle vehicle is $15 one-way during peak and $13 at off-peak times. Return trips within 24 hours are discounted, $3 (peak) and $5 (off-peak). The Chesapeake Bay Bridge Tunnel is a member of the E-ZPass electronic-toll-collection system. Motorists who use E-ZPass save time and reduce vehicle emissions. For additional information about the E-ZPass Virginia program, visit www.ezpassva.com. See a map and driving directions and learn more about the bridge amenities on the next page. The Chesapeake Bay Bridge-Tunnel offers beautiful views of the Chesapeake Bay as you travel between Virginia Beach/Norfolk and the Virginia Eastern Shore. From the North: Take US Route 113 to US Route 13 South and “Follow the Gulls” to the Chesapeake Bay Bridge-Tunnel. From the South: Take I- 64 North to US Route 13 North to the Chesapeake Bay Bridge-Tunnel. Chesapeake Grill & Virginia Originals - The restaurant is open for breakfast, lunch, and dinner. The gift shop offers Virginia products including gourmet foods and wine, clothing, customized gift baskets and more. Navy History Exhibits - The Hampton Roads Naval Museum has created six exhibit panels that introduce visitors to the U.S. Naval history of Hampton Roads, Virginia. Scenic Overlook - In addition to spectacular views of the Chesapeake Bay, the overlook includes a parking area and restroom facilities. The Sea Gull Fishing Pier is currently closed to the public due to construction.